Performance statistics are critically vital for the long-term health and capacity management of an enterprise environment. 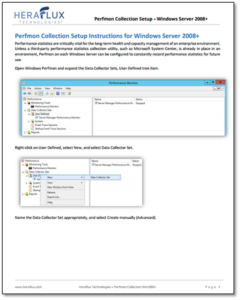 Unless a third-party performance statistics collection utility, such as Microsoft System Center, is already in place in an environment, Windows Perfmon on each Windows Server can be configured to constantly record performance statistics locally for future use. Download the Windows Perfmon setup guide now!